The mission of the Bread and Roses Center for Feminist Research and Activism is to promote feminist creativity, scholarship, and community engagement in support of the women's movement. 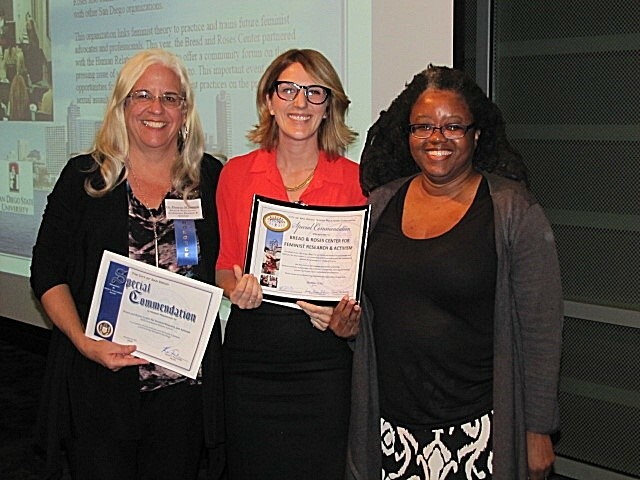 The Bread and Roses Center is the proud recipient of the 2015 Community Partner Award given by the Human Relations Com-mission of the City of San Diego. The award was in recognition of our collaborative work on campus sexual assault with the commission. To view pdf files you may need to download Adobe Reader. | To view Microsoft Excel documents (xls) you may need to download Excel viewer. | To view Microsoft Word documents (doc) you may need to download Word viewer.